Striper Cove South is a new penthouse condo offering panoramic views of the sparkling green Caribbean Ocean and the surrounding lush hills of Rincon, Puerto Rico. Perfect for a luxurious family getaway, or a corporate retreat, this condo combines oceanfront living with the comfort of first-class amenities. 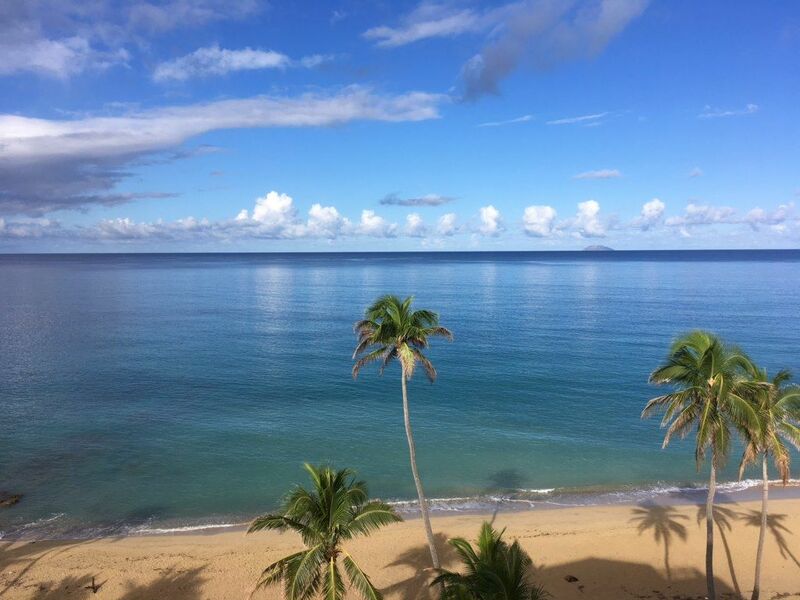 Deriving its name from a family vacation home on the Bass River in Cape Cod, MA, Striper Cove South is part of the renowned Macor by the Sea community on Corcega Beach, Rincon, one of Puerto Rico’s finest. Situated atop a waterfront building in a gated complex, this fully furnished 3-bedroom, 3-bath, 2-story retreat is the perfect spot to relax or use as a base for numerous island adventures, including the explorations of caves, rainforests, radio telescopes, or world-famous “tubular” surf. Gorgeous Views: This 3,350 sq ft two-story penthouse condo features an open plan kitchen-dining-living room and vaulted 18ft ceilings. An 'L' shaped, 14ft covered deck surrounds two sides of the condo with 300 degree views. The entire deck is furnished with chaise lounges and a complete patio dining area that easily accommodates eight people. Its the perfect spot to enjoy the morning sun and breathtaking sunsets. On the 8th floor, two bedrooms enjoy panoramic ocean-to-hillside views off their open balconies. The master suite features a king-size bed and a full private bath. The second and third bedrooms have twin beds and share a second full bathroom. A third full bathroom is located off the main living area. Well Appointed Amenities: SCS is well furnished and appointed. All linens, beach towels, furniture, appliances and utensils are included. The kitchen has granite countertops and stainless-steel appliances including a side-by-side refrigerator with ice-maker, an electric stove with warming drawer, a microwave, a dishwasher and a coffee-maker. Additionally, an Honest Bar is provided. You are most welcome to use this well stocked liquor cabinet; we simply ask that you replace anything that you use. A large dining table comfortably seats six, and an adjacent granite topped breakfast bar seats an additional four. The family room area has two sofas, two large rattan chairs with ottomans, and a 42' wide screen HDTV with Bose sound system. All rooms on both floors are air conditioned and have ceiling fans. Optional daily maid service and/or chef services can be arranged for an additional fee. Private chef and /or daily house keeper available upon request for an additional fee. Enjoyed Striper Cove South for the second year. Beautiful spacious condo right on the beach. Just doesn’t get any better. Thanks Dave and Kate! Corcega beach is wonderful. Condo is perfect for family. Rincon is a lovely place. The penthouse is exceptional , clean , well funished and equipped . Best vacation rental in Rincon. Kate is extremely responsive to any needs , the beach , pool everything you need for a great family vacation . There is not a better location or penthouse in Rincon. You never want to leave . We wanted to take our four college age kids on a holiday vacation where we could relax, spend time together and just enjoy the beautiful weather and Rincon & Kate's condo could not have been more perfect. The condo is a two level, beautiful, spacious, modern home with a beautiful panoramic view, and it was very comfortable for six adults. It is fully furnished with everything you would need to feel at home while you are there. The beach is right outside the pool area and it was very clean, quiet and relaxing for a day in the sun. The condo location is close to everything you would want to do in Rincon. We spent a few days at Sandy Beach which is a 15-20 minute drive, where we had a great time jumping and body surfing in the incredible waves. Wonderful restaurants close by and Kate had provide us with some great recommendations. This condo exceeded our expectations and I would highly recommend it and if we were to visit Rincon again, I would definitely want to stay here again. Thank you Kate for sharing your home with our family! Very clean, comfortable and has everything you need...The main living area along with the extremely large balcony are what make this condo above and beyond. Nice furnishings in the living area and balcony. The view from the balcony is breathtaking. The ammenities of the condo complex are extremly nice...pool, beach area, outdoor cooking area. The securtiy is also an added feature. Close to Rincon and other nice places to eat out. If you are looking for a place in this area....I highly recommend it. Your home is beautiful and the view from the penthouse balcony is breathtaking! I spent the week with 5 of my sister and four friends. We had more than enough room for 6 women! The home is well equipped and comfortable. Everything you need for a vacation in paradise was available to us! We spent every morning on the beach just steps from the condo watching the pelicans and collecting sea glass. We are already planning on another trip back to Rincon! All rentals are subject to a 7% Puerto Rico tourism tax. All rentals require a $1000 security deposit. The security deposit must be paid in advance of rental, and will be refunded based on condition of property after renter departure.